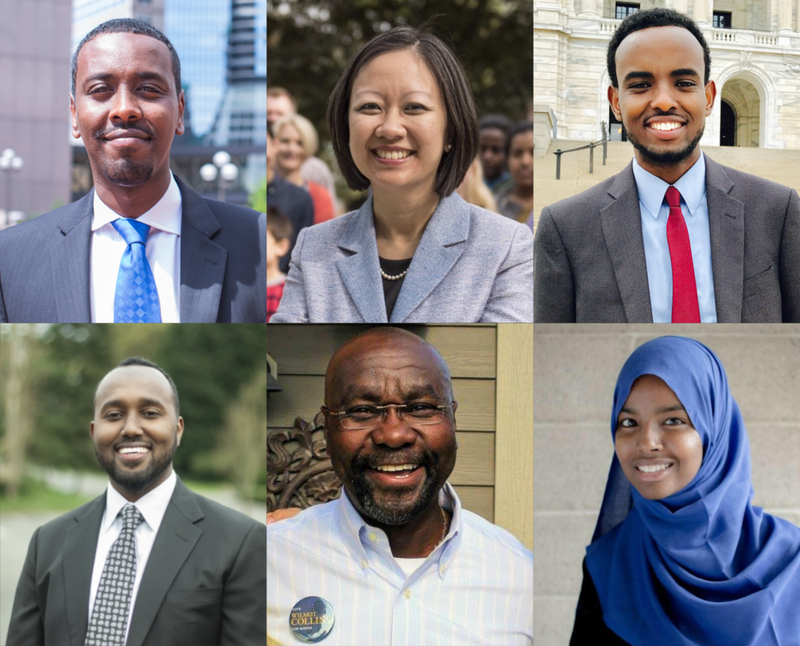 Top row: Abdi Warsame, Kathy Tran, AK Hassan. Bottom row: Zak Idan, Wilmot Collins, Fartun Ahmed. Abdi Warsame won a seat on City Council in Minneapolis, Minnesota. Abdulkadir Hassan won a seat on the Park and Recreation Board in Minneapolis, Minnesota. Fartun Ahmed won a seat on the Hopkins School Board in Hopkins, Minnesota. Zak Idan won a seat on City Council in the city of Tukwila, Washington. Kathy Tran won the seat for District 42 of the Virginia House of Delegates, the lower house of Virginia's state legislature. Tran will represent approximately 79,964 people living just outside of Washington D.C. Tran becomes one of the first two Asian-Americans to win this position. Wilmot Collins won the race for mayor of Helena, Montana. Collins will represent approximately 28,190 people living in the capital city of the State of Montana. Collins becomes the first Black person to win this position. Collins and his wife fled Liberia during the Liberian Civil War, where two of his brothers were killed.